Here's another Christmas card for you using an adorable image from Bugaboo Digi Stamps. They are our sponsor this week and are offering a wonderful prize - 7 digis of your choice. This particular challenge is to use our favorite Christmas colors. 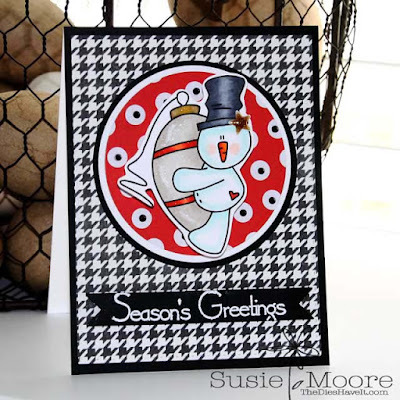 I love non traditional colors for my Christmas cards - so red and black were a natural for me! I threw in a little gold just for fun!! Oh - and you can't tell from the picture, but my snowman is on an Action Wobble, so he really swings and sways!! You should play along too and you can link up your creation at the Christmas Stampin' All Year Long blog. You have until midnight September 29, 2015 to link up. Have fun and I'll see you over at the blog.